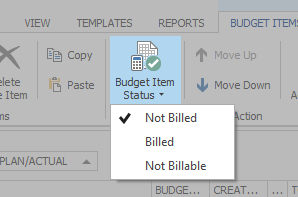 Every budget item can have one of three statuses: Not Billed, Billed, and Not Billable. Every newly created budget item is marked as Billable and Not Billed by default, which means that the customer will be billed for the service. Would you like an item to be documented, but do not want it to appear on the invoice, then mark the item as Not Billable. Already Billed items will automatically be marked by the system to avoid double billing. This also enables you to keep an overview over all items which have not yet been billed. Manage the status of a budget item - InLoox • Copyright 1999-2019 © InLoox, Inc. All rights reserved.